Best Landscape Design - Ladue News Platinum List Award Winner! The outdoor living season in St. Louis is already here, and we are so thrilled to kick off the season with some exciting news. 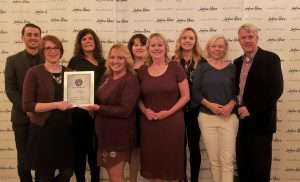 Quiet Village Landscaping recently won the award for Best Landscape Design in the Ladue News Platinum List Awards for 2019! Winning companies were chosen by Ladue News readers in the annual awards, hosted at The Coronado. Our team attended the awards event and were so flattered by what readers had to say about our landscape design services. In the Platinum List announcement “Ladue News readers love Quiet Village for its expert staff, professional and customized installations, and quality materials. But what wins Quiet Village extra praise is its commitment to environmentally friendly services.” We work hard to incorporate sustainable practices into every landscape design we create. This includes everything from our landscape designs, materials we recommend, and maintenance services we provide. This was the first time Quiet Village Landscaping has won the Best Landscape Design award from the Ladue News. We have previously been featured in articles by Ladue News staff, including this article on Rain Gardens. Thank you to everyone who has supported our eco-minded mission over the years, trusting us with your outdoor projects since 2001. Now is the perfect time for home and business owners alike to recreate their outdoor living spaces with a customized design to bring to life your ‘outdoor oasis’. Best of all, our entire landscape design team has just finished intensive DynaSCAPE Design training over the winter season to be prepared for another busy spring and summer in St. Louis. Our commitment to continuing education means our designs, practices, and landscaping methods are modern and efficient. Anyone within our service area can get started with a new design concept by filling out our Online Design Questionnaire here. This 5-minute survey gives us a great start with the key information that we need to begin created your new landscape design. We are also the premier landscape design and installation partner for the rainscaping rebate program in the St. Louis area. We work closely with the Deer Creek Watershed Alliance to help home and business owners receive the maximum rebates for any potentially qualifying projects. Interested in learning more? Just shoot us an email!